Australian Rotarians had been attending IGFR Tournaments since the first of these annual tournaments was held at St Andrews in Scotland in 1967, at which Stan Williams and Jack Fox from the Oakleigh Rotary Club in Victoria attended. To this date Australians have been represented at every IGFR Tournament since its inception. It was not until 1976, however, that a group of Australian Rotarians attending an IGFR Tournament in Hawaii, that a meeting was held in Kevin Beaumont’s room at the Royal Lahaina Hotel in Maui to discuss the formation of an Australian version of the International format. A constitution was drafted by Don McRae, Kevin Beaumont and John Hood and later adopted to form the basis of our current AGFR model constitution today. 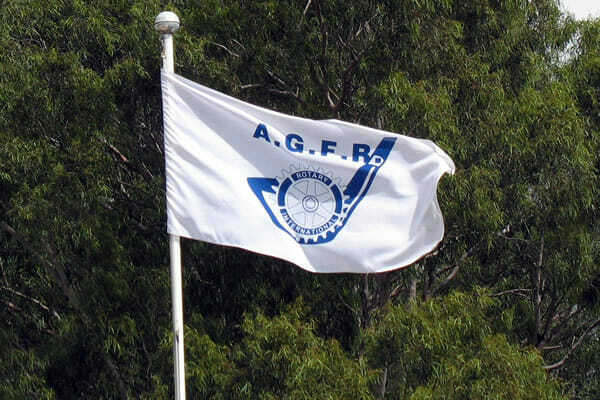 The original AGFR logo which was based on the IGFR style was designed by John Hood and Kevin Beaumont, however the current logo was designed by Peter Raue of the Wodonga Rotary Club and was first used in 1993 at the Albury/Wodonga tournament. The first AGFR Tournament was held in 1979 at the Peninsula Golf Club on the Mornington Peninsula in Victoria. Eighty-eight Rotarians accompanied by 28 partners played in the Inaugural Tournament, for which the Guest of Honor was the incoming President of Rotary International, James Boman and his wife. The first tournament was held over 3 days with 10 Rotary Districts and all States (except Qld) represented. The major trophy for the Rotarian team with the best total stableford score for the tournament was named after Sir Clem Renouf who was the current President of Rotary International, an Australian, and thus making it a very appropriate choice. This trophy was manufactured by ‘Flynns of Kyneton’ and the $1750 cash was jointly shared between the inaugural executive of the AGFR (John Hood, Kevin Beaumont & Don McRae), as the AGFR had no funds of its own at that time. The Trophy has recently been valued at in excess of $5000 but is priceless to the AGFR. Victorian Trophy – Rotarian Team with the second best total stableford score, was presented and made by John Hood. Royce Abbey Trophy – AGFR Champion with handicap – Rotarian with the best stableford score, was purchased with AGFR funds. South Australia Trophy – Division 1 Rotarian with best total stableford score, was presented by David Cleland. Tasmania Trophy – Division 2 Rotarian with the best total stableford score, was presented by Harry Clark. Glen Kinross Trophy – Senior AGFR Championship with handicap – Rotarians aged 65 or over with the best stableford score, was presented by Alistair and Avil Ward. Queensland Trophy – Division 1 Rotarian with the second best total stableford score, was presented by Ashley Harrison. New South Wales Trophy – Division 2 Rotarian with the second best total stableford score, was presented by Bob Louis. Northern Territory Trophy – Division 3 Rotarian with the best total stableford score, was presented by Wayne Nicholls. Australian Capital Territory Trophy – Division 3 Rotarian with the second best total stableford score, was purchased with AGFR funds. Following his term as Rotary International President, Clem Renouf was knighted and as we have had 4 Australians as Rotary International President it is fitting that we have an AGFR trophy named after each of them – Clem Renouf, Royce Abbey, Glen Kinross and Ian Riseley. Since the 2007 Tournament the original trophies are now displayed in Bostock House (District 9630) in Queensland, as the trophies became to bulky and dangerous to be carried interstate on aeroplanes to the various tournaments – so today all trophy winners are presented with a medallion of the same named trophies.